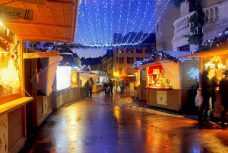 The Annecy Christmas market is the most important event in town during Advent. 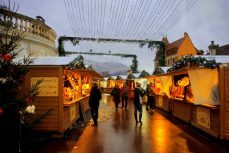 During the whole month of December, Annecy puts on her most beautiful festive clothes with street lights and illuminations, animations for children, concerts, Nativity scenes, Christmas markets, and more to discover… Each year, a new theme sets the tone for the Christmas season. 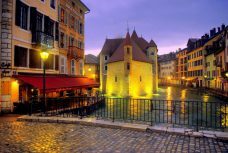 This is a good opportunity to discover Annecy from a new angle with the magnificent background of its lake and snow-capped mountains. 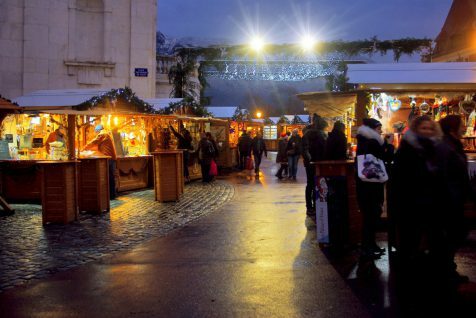 The Annecy Christmas Market draws some 450,000 visitors each year. 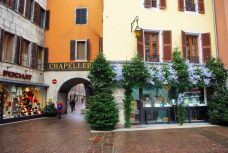 The chalets are gathered in two locations: in the neighbourhood of the City-Hall in the old town and the ‘Village des Alpes’ next to the Courier shopping centre. 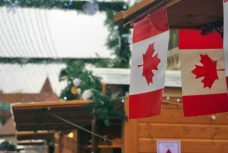 In 2017 the guest of honour is Quebec. 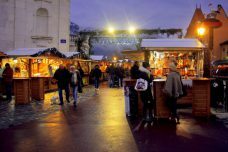 A number of events are organised in connection with the Canadian province and a Quebec-themed chalet can be found in the City-Hall Christmas market. 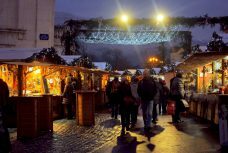 Found in the historic centre of the town, the City-Hall Christmas Market (marché de Noël de l’Hotel de Ville) gathers some 80 chalets selling regional craft items from Savoie, as well as alpine and French produce: tartiflette, cheese, gingerbread, nougat… The market spreads around the churches of St. Maurice and St. François de Sales (place Saint-François de Sales, quai du Semnoz, rue Saint-Maurice and quai Eustache Chappuis). 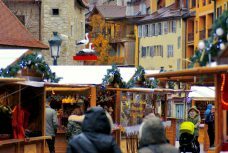 On a little square bordering the St. Maurice church are white wood chalets. 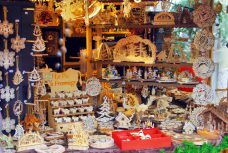 They form the small village of the artisans. 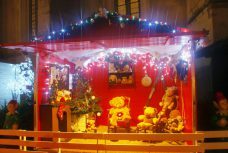 There you’ll find Santa’s House (la maison du Père Noël). 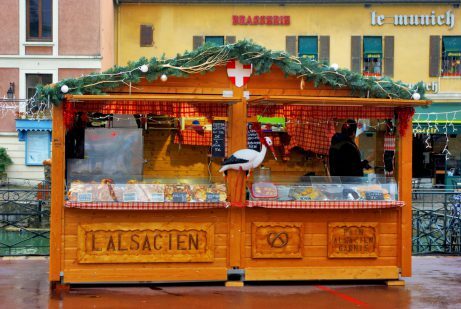 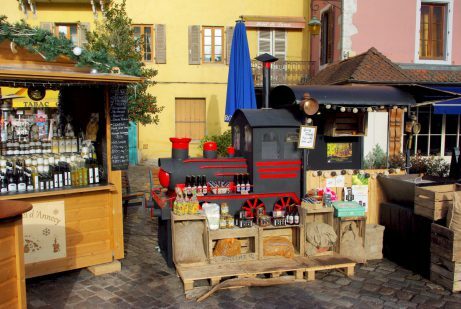 On place François de Menthon, in front of the Courier shopping centre, the chalets of the Alps Village (Village des Alpes) offer local and gastronomic produce. 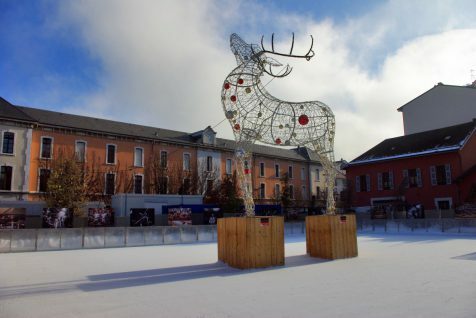 In the middle of the square is an open-air ice-skating rink (more info here). 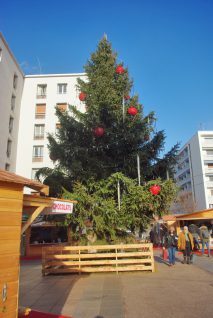 This is there that stands the great Christmas tree of Annecy. 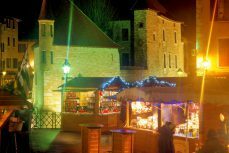 In 2017, the Christmas market will be open from 24 November to 7 January 2018. 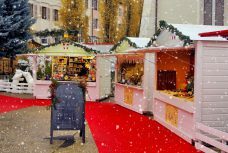 The 2018 dates are TBC. 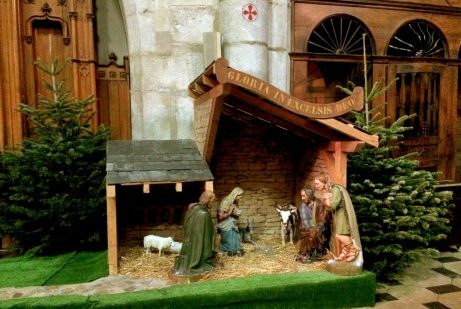 The churches of Annecy house traditional Nativity scenes from mid-December to the beginning of January. 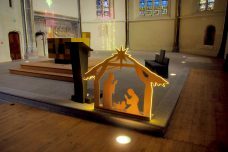 They can be seen inside the Cathedral, Église Notre-Dame de Liesse, Église Saint-Maurice and Église Saint-François-de-Sales. 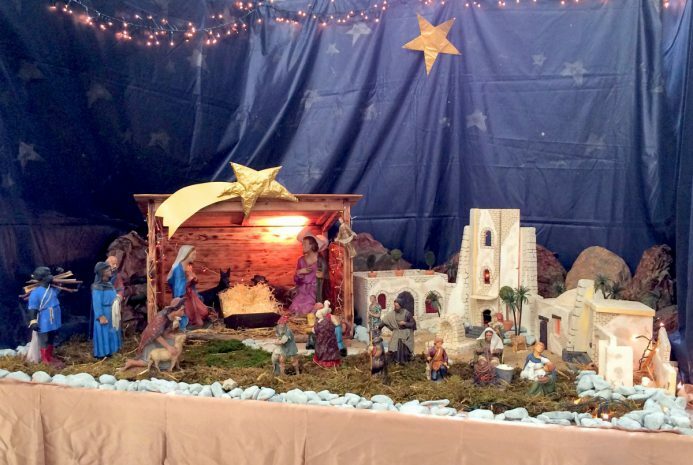 If you visit the churches before Christmas Day, the Nativity Scenes will be incomplete! 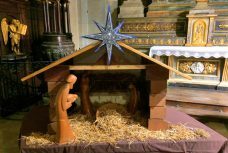 Infant Jesus is placed on Christmas night. 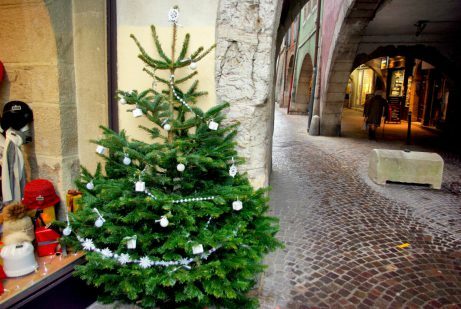 The Magi are traditionally placed later, on Epiphany Day (6 January). 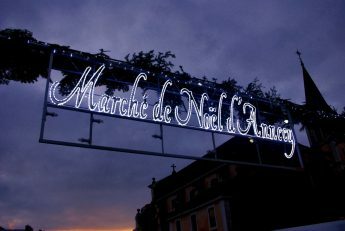 The sound and light show lasts 12 minutes with an 8 minute interlude. 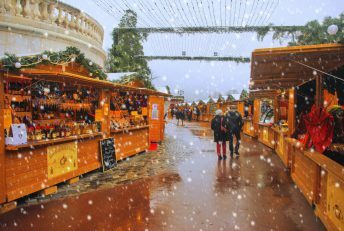 From 24/11/2017 to 07/01/2018, everyday from 5pm to midnight. 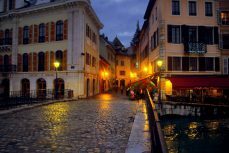 At any season of the year I enjoy strolling by the canals of the picturesque old town of Annecy. 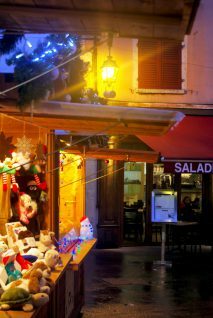 At night time Christmas lights can be admired in various places in the old town. 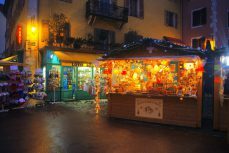 At night time Christmas lights can be admired in various places in the old town. 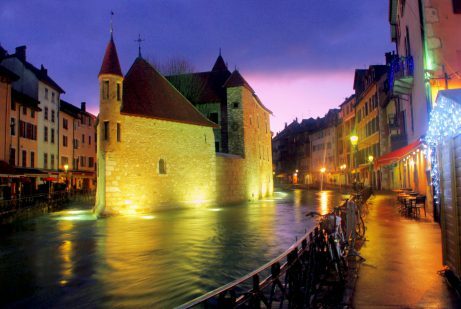 A favourite tourist spot is the Pont Perrière that offers a fine view to the Palais de l’Isle. 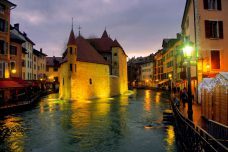 Pont Morens is another beautiful spot and is Annecy’s oldest stone bridge. 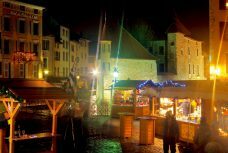 You can also have a general view of the River Thiou and the old town from Pont de la Halle. 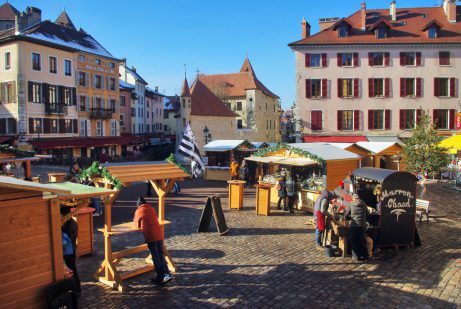 Only a few cities in France can boast of being situated between a gorgeous lake and snow-capped mountains. 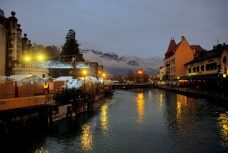 Nicknamed “the Venice of Savoy” for the enchanting canals that cross an old town centre clustered at the foot of a medieval castle, or “the Rome of the Alps” for a past comprising Catholic influence challenged by Protestant Geneva, Annecy will never leave the visitors insensitive of its charm. 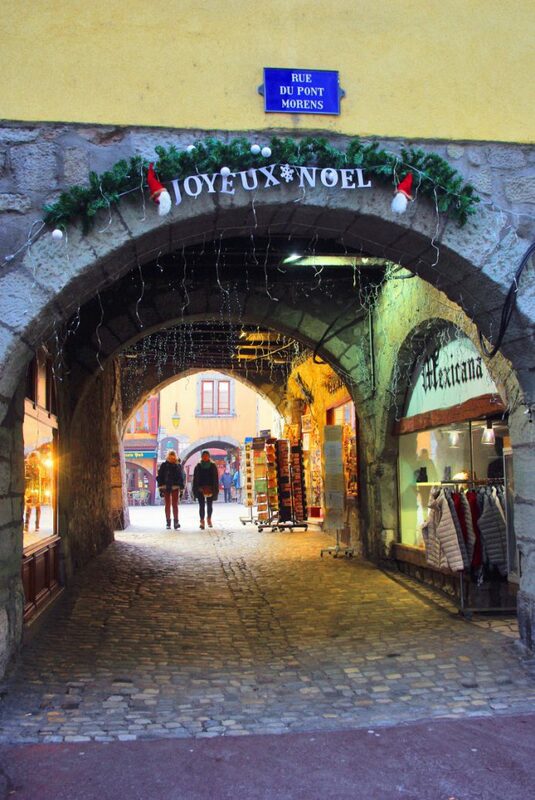 The most picturesque part of Annecy lies at the foot of the castle on the hill, a warren of lanes, passages and arcaded houses, below and between which flow branches of the Canal du Thiou, draining the lake into the River Fier. 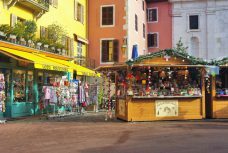 The houses, surrounded by canal-side railings overflowing with geraniums and petunias in summer or Christmas lights in winter, are incredibly beautiful. 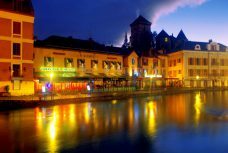 Find out more about Annecy and its surroundings here. 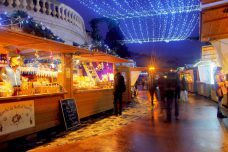 Check out the website of the Annecy Christmas Market for more info (in French). 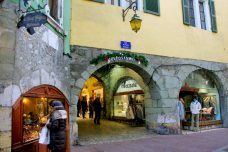 Visit the Annecy Tourist Office website for more practical information about the Annecy and its region. 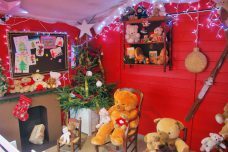 Previous ArticleEurotunnel to celebrate its 20th anniversary today!